Iranian authorities have detained demonstrators as protests over economic conditions spread beyond Iran’s capital Tehran to other cities. The latest wave of protests, spurred by a historic collapse of the Iranian currency, began on Sunday in Tehran’s cellphone market. They broke out in the Tehran Bazaar on Monday, with marchers then moving towards the Parliament building before they were blocked by police and dispersed with tear gas. Reports in local Iranian media on Tuesday described protests from Tabriz in northwest Iran to the markets in Qeshm Island in the Persian Gulf. 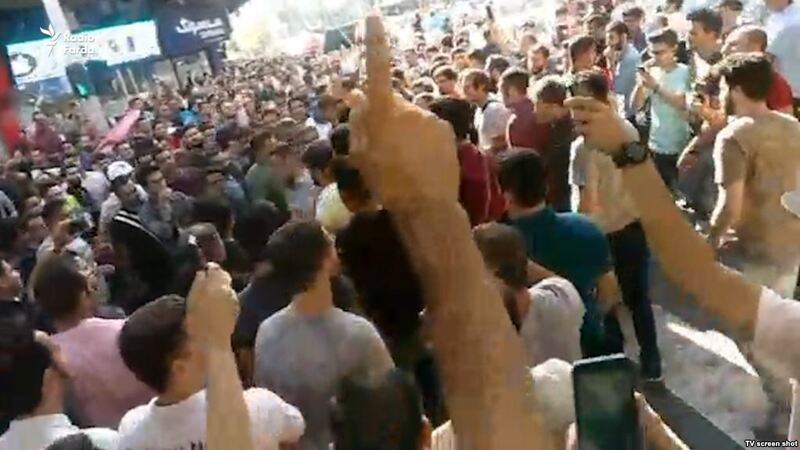 Judiciary officials said “a large number” of demonstrators were arrested, as judiciary head Sadeq Larijani warned that “disrupting economic activities may entail the death sentence”. In Tehran,officials announced the closure of some metro stations near the Bazaar. Fars, the outlet of the Revolutionary Guards, said some shops in the Bazaar remain closed. Other reports said demonstrations are also taking place in Bein ol-Haramain Bazaar, Tehran’s traditional market for books and stationery, and the blacksmith and jewellry markets. Videos on social media also showed closures in the bazaar in Kermanshah in western Iran and in the jewellers market of Tabriz. Today, can America use psychological and economic and eventually political warfare to break our nation? A proud nation that has stood up for its values throughout history; a nation that has resisted and stood strong and is ready to give its life and blood for Islam and Iran. Meanwhile, the Jomhouri Eslami newspaper focused on hardline challenges to Rouhani, including from the Supreme Leader’s office, as it said “a conspiracy against the Rouhani administration…will not stop here”. The Trump Administration took its campaign farther on Tuesday, saying all countries and companies must reduce oil trade with Iran to “zero” by November. The Administration has already pledged that it will punish any foreign firm with US links which trades and invests with Tehran from November 4. Oil prices immediately rose up to 4%, with the US benchmark over $70 per barrel and the international benchmark topping $76 per barrel. But there was some relief for the Rouhani Government, as its measures appeared to check the fall of the Iranian Rial. The posted rate for the currency recovered from its low mark of 90,000:1 on Monday to about 80,000:1 yesterday. Facing a halving of the currency’s value since January and the 20% drop in 48 hours, the Government announced over the weekend that alternative rates would be established for importers, especially of medicine and essential goods.